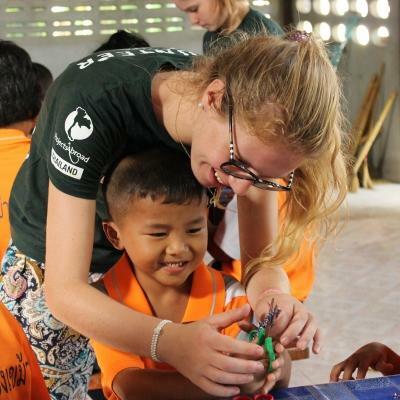 Join our Occupational Therapy internship in Cambodia and gain practical work experience while helping disabled children. You’ll learn a great deal from observing and working with medical staff and caregivers at the centre. This a different and memorable way to add work experience to your CV, and give back at the same time. 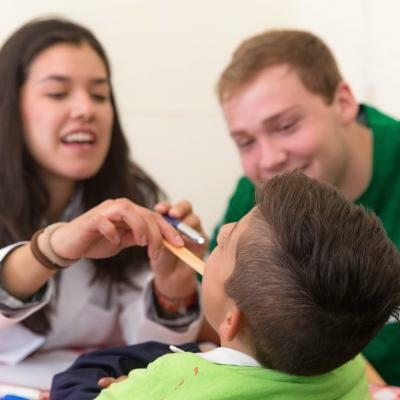 Through this internship, you’ll learn how to engage, assess, and treat children with varying disabilities. Your studies will be put to good use as you create individualised treatment and exercise plans. Through your efforts, you’ll help strengthen the mobility of each patient. Through this experience, you’ll learn to be more patient and compassionate, and your confidence in your work will grow. 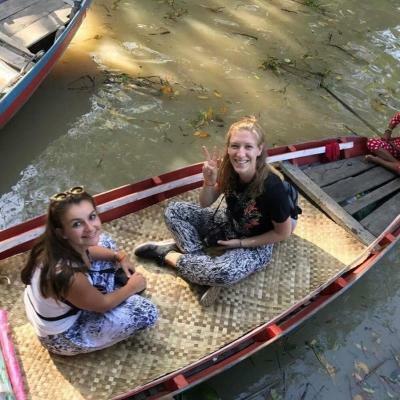 You’ll live and work in the charming capital city of Phnom Penh, and stay with other Projects Abroad interns and volunteers in a shared apartment. Use your free time to explore and eat your fill of Cambodian cuisine. You should have completed at least one year of occupational therapy studies or training. Is an Occupational Therapy internship in Cambodia right for me? Are you working towards a career in occupational therapy? Do you enjoy working with children? 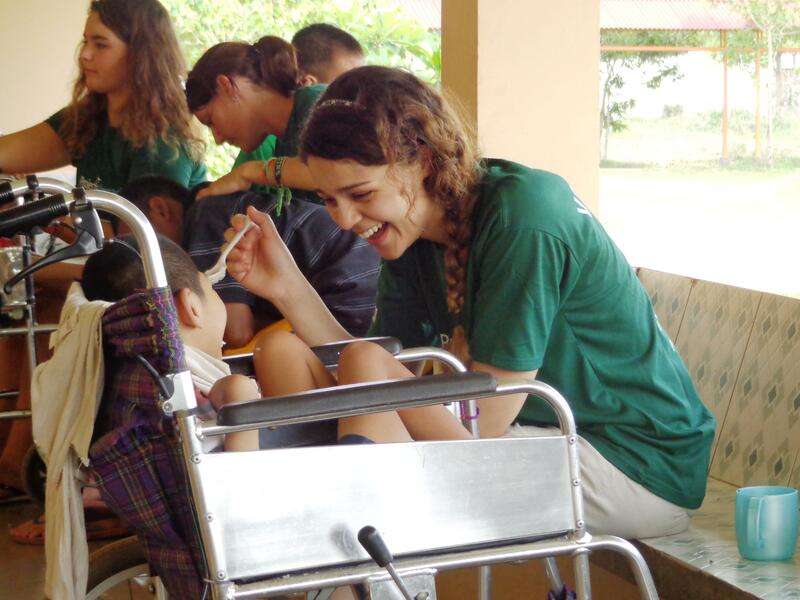 Then our Occupational Therapy internship in Cambodia is for you. 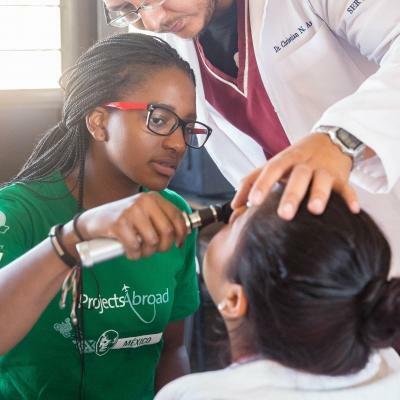 You’ll learn practical skills alongside qualified medical staff and caregivers, which you can use this to enhance your studies. This internship adds great value to your CV, and gives you interesting points to talk about in applications and interviews. Your work in Cambodia also demonstrates your commitment to therapy, and your willingness to help those in need. Our internship is open to occupational therapy students who have completed their first year of study. The project runs all year round, so you can join whenever you want. You can intern for a minimum of two weeks. We strongly recommend staying longer so you can have a bigger impact on the children. What will I do during my Occupational Therapy internship? Before starting any form of work, you’ll spend time shadowing and observing the centre staff as they work with the children. You’ll learn how to pick them up, engage with them, and assess and treat them. Each child will be different depending on their disabilities. By observing first, you’ll get to know the children and learn skills that will benefit you in the future. After observing, the staff might ask for your assistance with the assessment and treatment of patients. For quick reference on each patient, you can observe the wall which displays all the patients details. This wall has patient cards which detail the progress of each child. It gives staff an idea of the patients’ disabilities and which goals they should work towards. These goals could be anything for each patient such as rolling over, sitting, or standing. You’ll also assist with the creation and implementation of individualised exercise plans that help strengthen the mobility of each patient. You need to monitor their progress and ensure accurate records are kept. To ensure all staff members and future interns are up-to-date with the progress of each child, you’ll be asked to add information to their patient files. You’ll also need to update the patient cards attached to the wall. There is a lot you can learn from the medical staff and caregivers at the centre. However, they can also learn a lot from you. Occupational therapy is not a widely known profession in Cambodia, and the staff will benefit from learning different techniques that you were taught during your studies. You can also help improve the English levels of staff members, which will make it easier to communicate with them. 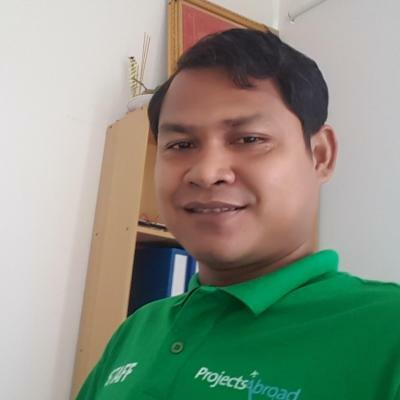 You’ll be based in the capital city of Phnom Penh. With its beautiful riverside promenade along the Mekong and Tonle River, and the many historical sites, this city is definitely one tourists can’t get enough of. There are a host of attractions in this ever-modernising city, including the genocide museums, Royal Palace, and markets. 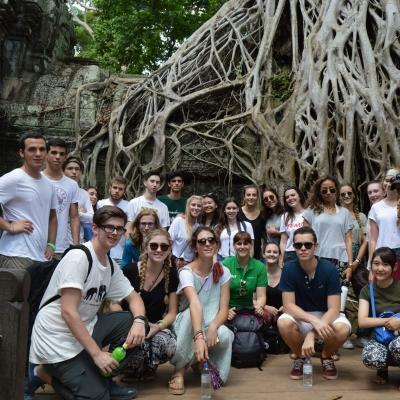 The famous Angkor Wat Temples are only a few hours away! You’ll gain occupational therapy work experience in Cambodia at a centre for mentally and physically disabled infants and children. Many of them were abandoned by their families because they couldn’t afford to care for them. The centre provides the necessary support and care to these children. You’ll start each day with a Cambodian breakfast of fresh fruit, banana pancakes, and egg fried rice before grabbing a tuk tuk to your placement. Our staff will accompany you on your first day to show you the way, and introduce you to your new colleagues. A typical day will start at 8am and end at 4pm, Monday to Friday. You’ll get a long break between 11am-1pm where you’ll head back to your shared apartment for lunch. Alternatively, you can pack a lunch, and spend time going over the children’s medical files during your break. Each morning, you’ll go over the plans for the day with your project supervisor. Your main focus will be to help with the assessment and treatment of patients at the centre. The infants and children have varying degrees of disability. Many of them have been diagnosed with cerebral palsy or autism. You’ll help with individualised exercise plans, progress monitoring, and updating patient files. You’ll spend an hour with each patient before moving on to the next. In your free time, you can grab dinner at one of the many restaurants dotting the main street. 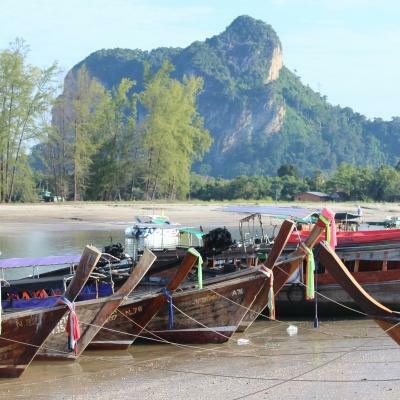 You can plan weekend trips with the other interns and really make the most of your stay in Cambodia. 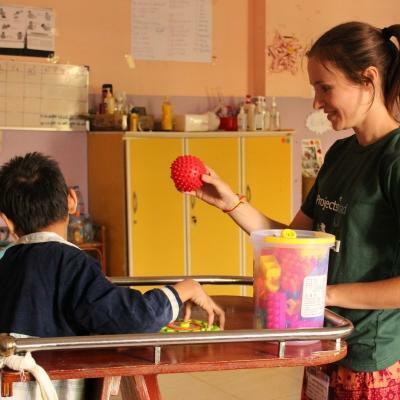 There are two main aims for our Occupational Therapy internship in Cambodia: to improve your skills, and to provide better quality care and additional support to the infants and children we work with. You’ll work at a centre for infants and children with mental and physical disabilities. Many of these children were abandoned by their families because they were unable to care for them. The medical staff and caregivers at the centre provide them with care and a safe place to grow up in. You’ll use your skills and training to support the children, and share knowledge with the local staff. Occupational therapy is not a widely recognised profession in Cambodia so you’ll need to be confident and proactive when working. Supporting local medical staff also means that more children will be able to receive treatment at the same time. 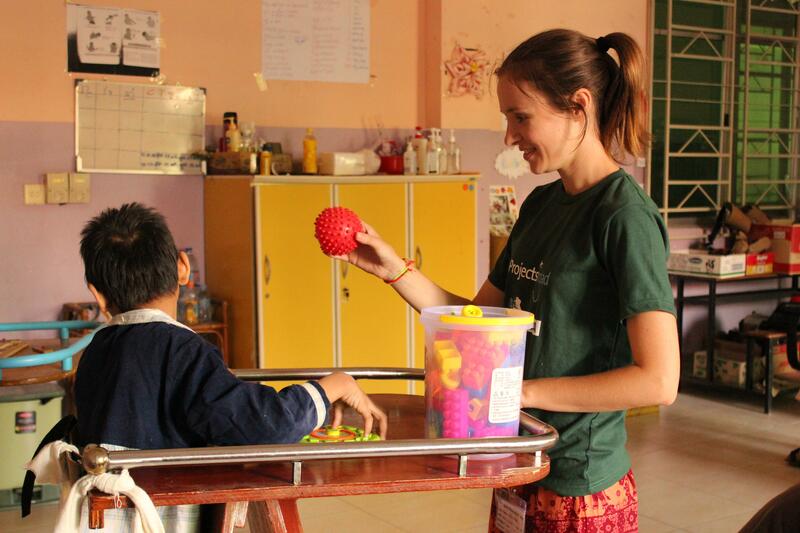 Join this internship in Cambodia and help us work towards these goals while improving your occupational therapy skills. I gained skills in massage and manipulation alongside a great deal of knowledge around cerebral palsy, the predominant disability at the centre. There are also ample opportunities to use graded activities and games to help improve a child’s sensory, process and motor skills. Seeing even the smallest improvement in a child’s functioning was so rewarding and satisfying!